Howlite is a stone of calm and awareness. Howlite stones are supportive in preparing your mind to welcome wisdom and insight. They are helpful for meditation and sleep, allow for reasoned communication, and strengthen memory. Amethyst promotes inner strength and stability. It stimulates the crown chakra which allows for an open channel to a higher consciousness. The deep purple color of the stones will instill a sense of wonder and amazement of how lucky you are to be alive. Howlite and Amethyst is the perfect stone combination if you are looking to become more self aware and increase your ability to live in the present moment. 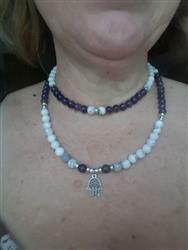 This beautiful mala features a silver Hamsa pendant which is a symbol of protection and strength. It helps to shield you from negativity and maintain a personal barrier of emotional stability. It’s gorgeous and has a calming effect—what more could I want? I thought it was beautiful in the photo but it's even more beautiful in real life. I use it for meditation just by wearing it, I feel a sensation of nice vibrations. Thank you! Oh I'm so blessed they are beautiful and I'd like to continue to order from you great quality and price I plan to also give these as a gift to others in the future. Thank you for creating such wonderful pieces! Got these for my wife for her birthday, she absolutely loves this mala and she couldn't wait to meditate with it that night. Beautifully made and its very special! Thanks for making her day.